This is my 31st Chinese Bai Mao. Baimiao is painted with line by Chinese ink. 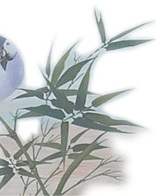 It is a kind of Chinese Gongbi painting. At the first, it is a draft of a Gongbi Dancai or Gongbi Zhongcai, then it was developed to be a single art form by Chinese ancient artist Li Gonglin(1049-1106). Also it can be colored, in case it has been colored, if we colored it with a light color, we call it Gongbi Dancai; if we colored it with heavy color, we call it Gongbi Zhongcai. Do you like this kind of art form? Do you like I color it to be a Chinese Gongbi Painting?